At Amazin' Aces Quality Sporting Goods, we LOVE pickleball and know you will too! 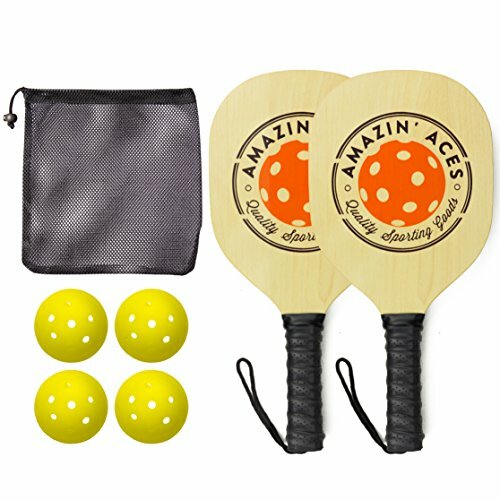 Our set includes two (2) Amazin' Aces wood pickleball paddles, four (4) pickleballs, & one (1) mesh carrying bag - makes a great starter pickleball set. This set is lighter than many other wood paddles on the market and features a cushion grip with wrist strap. This item is perfect for those seeking a pickleball paddle that is a great value. This bundle is good choice for schools, YMCAs, rec centers, community centers and other organizations that might provide paddles to groups of pickleball players. Our rackets are made from maple - seven plies of maple are fashioned together to make a strong and rigid paddle core. The paddle's grip is a high quality polyurethane grip. The grip has a slightly elevated ribbing around the handle that provides great feel for gripping the paddle's handle. Colorful screen printing of the orange pickleball and Amazin' Aces name is displayed on both sides of the varnished paddle faces. A wrist strap is added to the end of the handle for those that want to ensure the paddle doesn't fly out of their hands during play or for the convenience of storing the paddle on a hook or nail. The set comes in a sharp looking box with the Amazin' Aces logo on the front - it makes a great gift for those that have friends or family who are interested in getting started with the awesome game of pickleball. With purchase, you'll also receive our PDF guide via email with rules, tips, and more. Note the pickleballs themselves are durable outdoor balls (however they also work well indoors). Dimensions: 7" W x 15-1/2" L Grip Circumference: 4-1/4". Meets USAPA specifications. GREAT VALUE: Set includes two (2) premium wood pickleball paddles, four (4) pickleballs, & one (1) mesh bag for convenient carry and storage of your pickleballs. Start playing pickleball with great gear at a great price! FREE EBOOK INCLUDED: With purchase you'll also receive our e-book, "The Ultimate Beginner's Guide to Pickleball". This comprehensive e-book contains rules and tips to help you hit the ground running on day one! If you have any questions about this product by Amazin' Aces, contact us by completing and submitting the form below. If you are looking for a specif part number, please include it with your message.